3 in x 3/8 in DeWalt Screw-Bolt+ High Performance Screw Anchor at Badgerland Supply, Inc. The Screw-Bolt+ anchor is a one piece, heavy duty screw anchor with a finished hex head. It is simple to install, easy to identify and fully removable. The patented thread design, designed for use with standard ANSI drill bits, reduces installation torque and enhances productivity. The steel threads along the anchor body tap into the hole during installation to provide keyed engagement and allow for reduced edge and spacing distances. 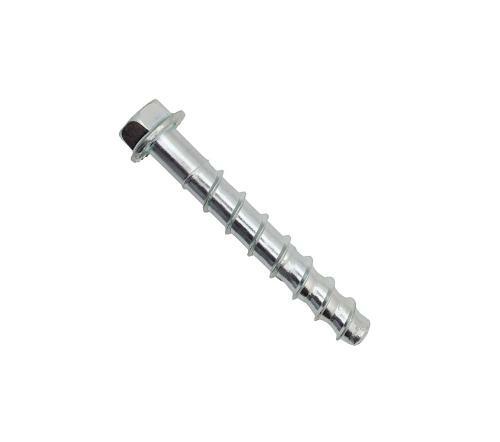 The Screw-Bolt+ finish is available in bright zinc-plated and mechanically galvanized. Suitable base materials include normal-weight concrete, sand-lightweight concrete, concrete over steel deck, concrete masonry and solid clay brick.